Byron Au Yong’s Kidnapping Water: Bottled Operas is a shapeshifter of a piece. 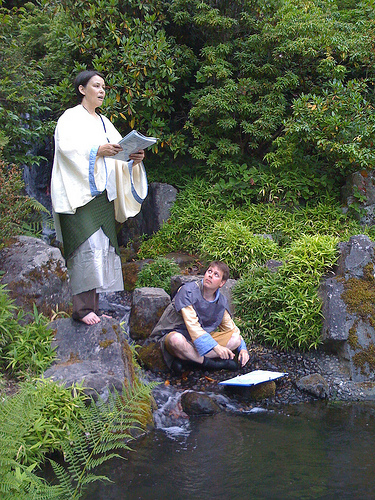 First, it was guerilla art, performed for audiences of one or two or a dozen people from within bodies of water in King County. Next, it was formally packaged, blocked, and turned into a ritual at Bumbershoot. In its current phase, it is an installation at the Jack Straw New Media Gallery, a collaboration between Byron and Randy Moss. At its heart, the piece is 64 exquisitely crafted songs for solo singer and accompanying percussionist. There is also a percussion quartet. I had heard neither the quartet nor any of the songs written for the other singers, since we all performed on different days in different locations. So for me, the installation was a great chance to hear performances of the rest of the piece – very beautiful, and very restful to listen to in the gallery space with its watery circle of flickering LEDs. The performances were recorded in the Jack Straw studio after Bumbershoot. Recording water percussion in a studio is an activity fraught with danger! Mics and fancy electronic recording gear don’t necessary mix well with flailing percussionists, tubs of water, and flying droplets. In the end, they were successful: the combination of water, gongs, metal scraps, wooden bowls, stones, bones, and the human voice form an intimate mix that flickers and ripples across many emotional states. Posted by David Stutz on Saturday, September 13, 2008, at 10:24 am with permalink. Tagged byronauyong, experimental, opera, performances.